The Born Free-supported Freeland has assisted authorities in Thailand with the arrest of a gang of tiger poachers following a three-month investigation. Freeland assisted the authorities after a fresh tiger skeleton was found inside baggage of two Vietnamese nationals. 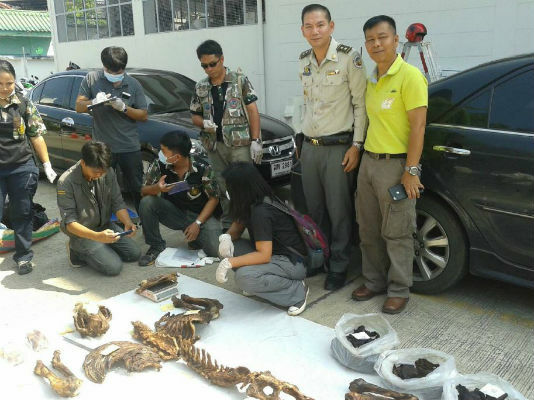 Using Freeland’s forensic experts, evidence was found that the poachers, had crossed from Laos into Thailand to poach tigers. The poachers documented their trips on their phones, including photos of tiger kills. Tigers are classified as Endangered by the International Union for Conservation of Nature and trade in the species is prohibited under the Convention on International Trade in Endangered Species. Demand stemming predominantly from east Asia is driving the illegal trade of tigers. It is likely that the tiger skeleton would have been used to make tiger bone wine, which is promoted as a ‘traditional’ treatment for arthritis and impotence. Born Free supports the Hasadin Anti-Poaching Rapid Response Unit, working in Dong Phayayen-Khao Yai Forest Complex, Thailand. The rangers have been put on high alert for more poachers coming from Vietnam to hunt tigers.